A favorite collection of thirty-five poems for and about black children celebrates the energy and joy of life. 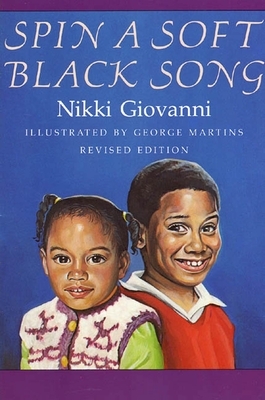 Nikki Giovanni has written many books of poetry for children and adults. She is the author of Rosa, a Caldecott Honor book, Lincoln and Douglass, The Genie in the Jar, and Ego-tripping and Other Poems for Young People. Giovanni calls herself, "a Black American, a daughter, a mother, a professor of English." She was born in Knoxville, Tennessee, and grew up in Lincoln Heights, an all-black suburb of Cincinnati, Ohio. She studied at Fisk University, the University of Pennsylvania, and Columbia University. She published her first book of poetry, Black Feeling Black Talk, in 1968, and since then has become one of America’s most widely read poets. Oprah Winfrey named her as one of her twenty-five “Living Legends.” Her autobiography Gemini was a finalist for the National Book Award, and several of her books have received NAACP Image Awards. She has received some twenty-five honorary degrees, been named Woman of the Year by Mademoiselle Magazine, The Ladies Home Journal and Ebony, was the first recipient of the Rosa L. Parks Woman of Courage Award, and has been awarded the Langston Hughes Medal for poetry. Nikki Giovanni lives in Christiansburg, Virginia, where she is a professor of English at Virginia Polytechnic Institute.